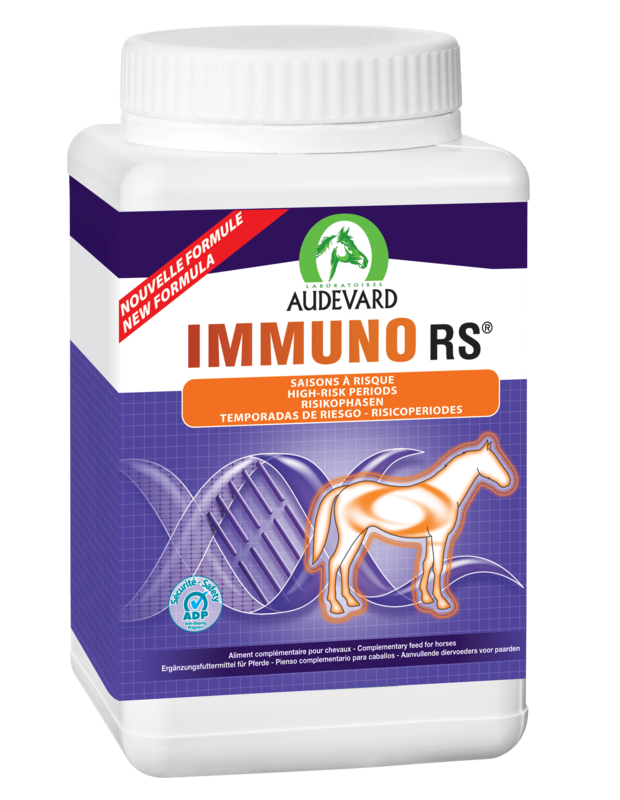 Immuno RS is an apple-flavoured nutritional supplement, designed to support the immune system of horses & foals during high-risk periods eg intensive training; relocation; winter. It is their own immune system that protects horses from viruses, bacteria, parasites & any other harmful pathogens. Horses who have a weaker immune system are more prone to developing infections & disease. Immuno RS contains Echinacea, which has been shown in studies to be an immune stimulant that has beneficial effects on the immune system. Immuno RS also include a B glucan, Glucafeed. B glucans have also been shown to modulate the immune system. In addition, it has the advantage of incorporating a number of anti-oxidant vitamins & minerals, such as Vitamin A, C, & E, as well as zinc & selenium. Immuno RS should be given to horses or foals during high risk periods, starting a few days before being introduced to a new environment. Feeding Instructions- Give 50g twice daily for 10 days - 3 months, or continuously if neccesary. These high quality sterile, disposable syringes are individually wrapped & can be used for precise and controlled administration of oral medications & injections. They can also be used for aspiration of fluids or for sampling blood or other body fluids. 60ml Dosing Syringes can be used to administer oral medications. Farnam Red Cell Liquid is a well-known & trusted Iron, Vitamin & Mineral supplement. High levels of iron support production of your horse's red blood cells, maximising their performance potential. Protexin Gut Balancer is a palatable prebiotic & probiotic powder, ideal for improving the efficiency & function of your horse's digestive tract. It can be used in all horses to promote general wellbeing & can help if they are prone to digestive upsets. Protexin Quick Fix is an extra strength paste, full of Protexin prebiotics & probiotics. It's ideal to be given as a short 6 day course, to ensure gut stability whilst travelling or competing, or when worming or giving antibiotics. Needles are used to administer injections. They are sterile & come individually wrapped, in a number of sizes. They can be bought either singly or in packets of 100.